We are engaged in manufacturing high grade Low Voltage Cable Breakouts in various grades and specifications, Low Voltage Cable Breakouts provide a strong and permanent environmental seal to the crutch of 2, 3, 4, 5,6 and 7 core PVC, XLPE Rubber and PILC cables upto 3.3 KV rated voltage. The Breakouts are Manufactured form high quality cross linked polyolefin material that offer an exceptional insulation and long term service reliability. TheLow Voltage Cable Breakouts are internally coated with hot melt adhesive. 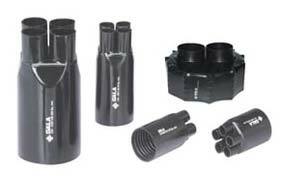 These breakouts when installed in position provide 100% water/moisture proofness to the system.